This past Sunday I had a special kayaking date with one of my cousins who was in town for my grandma's birthday bash. Many of my previous blog posts from the early summer months were inspired by conversations we had and books he suggested I read. Incidentally, both of our past struggles have brought us closer than ever before. I finally found someone outside of my treatment/recovery friends who truly understands parts of my brain that no one has even come close to grasping. One of the first conversations we had, was in response to the to-do list post I wrote a couple weeks ago. 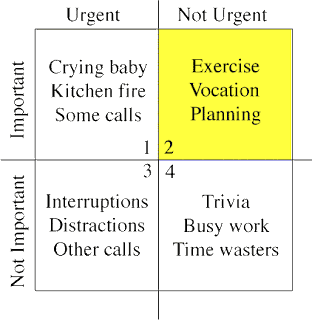 In the book The Seven Habits of Highly Effective People (and also First Things First) written by Steven Covey, the idea of the Time Management Matrix or Quadrant is introduced. By using these ideas, it becomes easier to prioritize my daily tasks and keep my sanity. Like I mentioned in the to-do list post, I often feel overwhelmed after writing my to-do list. While looking at all that needs to get done and then wondering how I will find the time to get it all done, my anxiety quickly rises. Also, I have mentioned several times throughout this blog that in my past, while I was sick, I would avoid my to-do list all together as a way to temporarily escape my anxieties. 1. Urgent and important - items that need to be dealt with immediately. A few examples would be homework or projects that have specific deadlines and family emergencies. I would also put my continued health in recovery in this category. 2. Important, but not urgent - items that need to be planned for. Some of my examples are getting some fresh air, social activities, and blogging. 3. Urgent, but not important - should be minimized. Examples would be phone calls or text messages that don't necessarily have substance and other distractions. 4. Neither important or urgent - should be minimized or eliminated. These activities typically force us to ask ourselves what we are avoiding. Mindless web surfing, video games, or watching too much TV might be examples. I think there are two main things I took away form this after prioritizing this week's to-do list; 1.) It's perfectly okay if I don't get certain things done on my list and 2.) I really do have enough time in my day to accomplish everything I need to. There are certain things in my day that are important and will help me achieve long term goals, but they are not urgent. If I don't get my laundry done, for example, rather than feeling like I didn't get everything accomplished, I can remind myself that there is always tomorrow. I know that sounds really simple, but by letting go of these perfectionist tendencies that tell me I need to accomplish every single thing on my list, I am actually making huge progress. 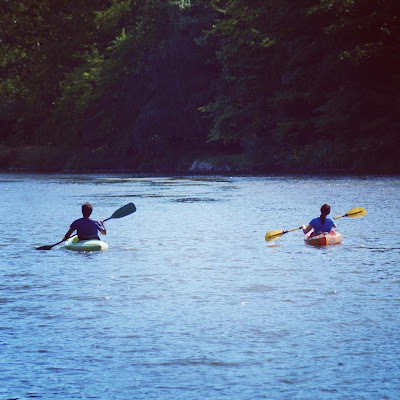 As great as these ideas are, more importantly, I am able to step away from the weekend's kayaking adventure and see tremendous changes in myself. While I was caught up in my eating disorder, there's no way I would have even considered alone time, serious conversation, or potential bonding with anyone. I am happy to report things are beginning to settle down at school and thanks to my new approach to making a to-do list, I feel much more at ease. 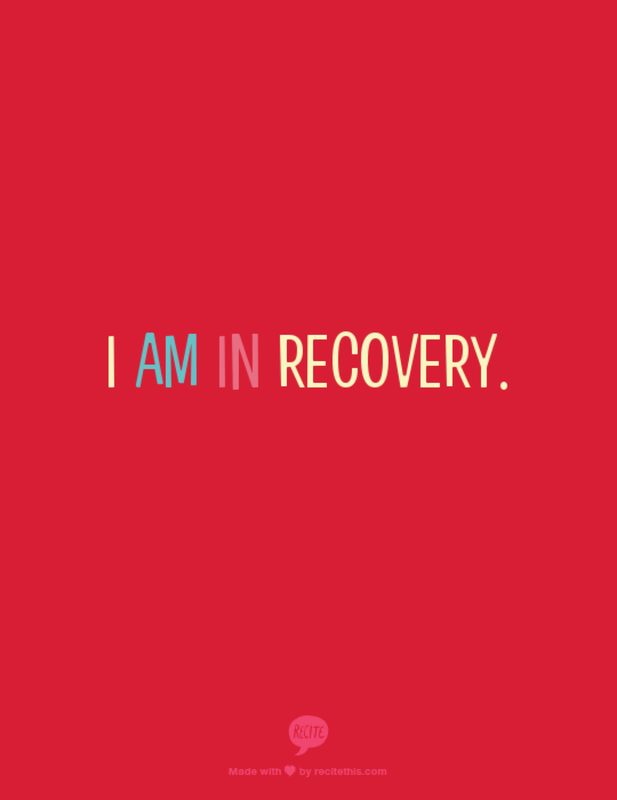 Recovery, as I am learning, involves so much more than eating and weight maintenance. Sometimes I feel embarrassed because I need professional help to manage these day-to-day stressors; but at the same time, however, I am also starting to realize that I kind of missed out on crucial young adult developmental years while I was sick. 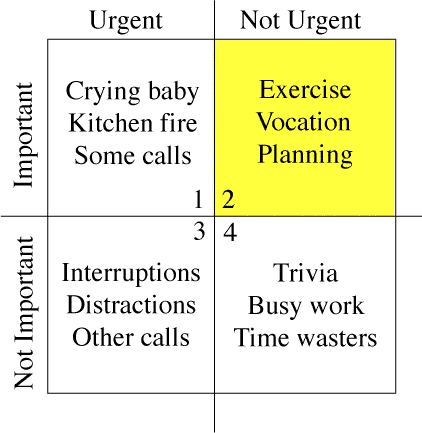 Although I might never be free from daily to-do lists and life's endless changes, at least I have cousins and tricks like the time management quadrant to help me get by. Today I only have two important and urgent tasks on my to-do list and anything else I accomplish is a bonus - I think I can handle that. Absolutely. And sometimes I feel guilty for not having the skills to get through everyday life experiences as silly as that sounds. So glad that you are finding yourself better able to manage. I've just started a counselling internship and I think I'd better figure out how to deal with my anxiety and stress pretty quickly or I am going to burn out. Balancing recovering with engaging in life in ways to reach the future I want... I never imagined it could be so challenging. I hear you about sometimes feeling silly about needing extra support and yet, our realities dictate that if we don't ask for what we need, we certainly won't get it. I'm glad you realize the importance of looking after your health - it's the only way to accomplish all the wonderful things you want to do. We all need professional help dealing with it, few are brave enough to admit that. Crazy thing is, I didn't think I looked sick at the time the pic on the left was taken. That wasn't my lowest. I absolutely follow where you were going with that haha. I love the idea of a "choose-your-own-adventure story! I hope you're doing well! 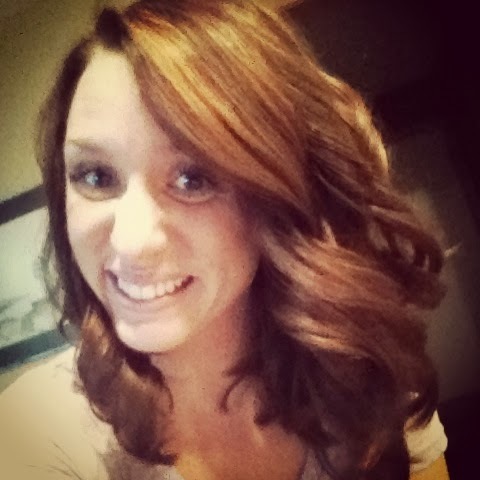 Kelsi you look so amazing in those pictures (yes, the healthy ones) and don't let ED turn that into a negative thing. It's so inspirational for me, especially as I get closer to my "goal weight" in recovery. I am so moved by this post. Thank you. Thanks Aunt Judy. Love you!